My six year old son and I have spent the last eighteen months trying to complete our FIFTY QUARTERS OF THE UNITED STATES OF AMERICA collection and about three weeks ago, eighteen months after we started our collection, finally acquired the continuously elusive, highly-sought after, and highly prized (if only to us) Alabama Quarter! We spent untold hundreds, possibly thousands of dollars just for the sheer joy of getting back change. It became our quest in life! Whenever we received change, before we even took two steps, we carefully inspected the “quarterbacks” to see if we found the lost one we were searching for. 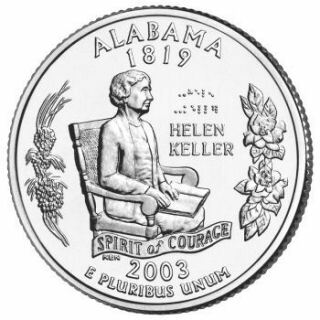 I even put a note on Facebook once seeking the Alabama quarter. No response came, though I did get an email from a friend once saying he had a few quarters for Tyler to add to his collection. It was a fair trade, because we had previously adopted a stray cat from him that he was desperately trying to find a home for. Actually, Toby is a very beloved member of our family now, so to be paid fifty cents for taking a cat, well, in this economy that’s a darn good deal, even though my husband may state otherwise. We also were known to short a waiter or waitress a quarter or two, if we looked down at the tip and realized, “Aaggh….this is one of the quarters we don’t have.” If you were one of the servers short changed by our mission, I sincerely apologize here publicly. It was not your service, but only our need to complete the collection. So when my daughter came home from college three weeks ago, and stated that she had found the Alabama quarter in the cash register at the job she worked at, we were overjoyed! We had even found the Puerto Rice quarters (there are four of them. Huh?? How come they get four different versions?) American Samoa, the US Virgin Islands, though we still have yet to find the Northern Mariana Islands or Guam. We even acquired the District of Columbia quarter, which certainly could be considered one of the “island” quarters, since Washington DC seems to operate outside of all reality, that the other fifty states have to ascribe to. In our traveling experiences to DC, I find you have to carry a large stash of money with you anyway, just as you would were you to travel to one of the US exotic islands for basic essentials like eating, parking, accommodations, and of course, tips! See what I mean? There are only forty three states!! In my effort to punish myself for not knowing my geography, I REFUSE to Google this and find the answer. I keep mentally trying to picture the US in my head, and still I come up empty. My son, who is only in kindergarten, did not recall these because of the way he knows the map, but because of the way he knows who or what is on the back of each quarter. That makes me feel even worse, because except for some Georgia Peaches, a Florida Astronaut, the Wright Brother’s plane of NC (I should know this one! ), and the Capital of the Washington DC quarter, or the Kentucky Horse, I can’t even remember the other quarterbacks though I spent the last year and a half looking at them astutely. Though it’s going to irritate me to no end, I know somebody is going to just rattle off one of the seven states that escapes my memory. Maybe you can do this without cheating and tell us the answer. I also think, how even though I can’t recall the entire fifty states that I’ve been blessed as being a part of for forty seven years, I am thankful I can at least remember all three of my children’s names, for now that is, even if I call them by the wrong one occasionally. I’m also reminded whether we are looking at a penny or a hundred dollar bill, there is a small disclaimer: IN GOD WE TRUST. Earning, collecting, spending, winning, receiving, and above all giving money are all the trials and joys we experience all our life, all in the name of money. So it’s wise to remember, that in each of the ways we encounter money, to remember WHO our trust is in, and though I may not recall the names of all fifty states, we have a God who knows each of us by name, the number of hairs on our head, and all the worries and cares that live in them, as well as our hearts. Knowing God is free, but the value is priceless. Find, collect, and treasure the currency you value in life. And spend it wisely! Be blessed!